Brookline High senior Andrew Geschickter has been playing basketball for as long as he can remember. This summer, his love of the game took him on an 11-day trip through Belgium and Germany playing basketball as part of the Greater Boston All-Stars team. While abroad, the players stayed with host families in Dresden, Germany and Brussels, Belgium. 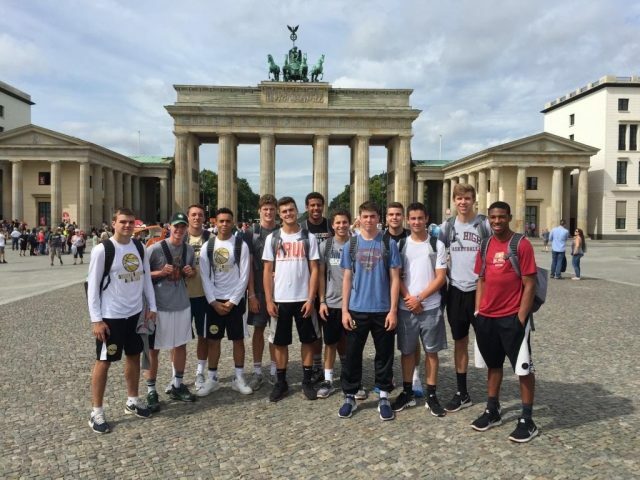 When they weren’t playing basketball against top teams in Germany and Belgium, the boys spent time touring Berlin, Dresden, Prague, Amsterdam, Brussels, and Ghent. Not only was the trip Geschickter’s first time in Europe, it was his first time in a continent other than North America. If given the opportunity, Geschickter said he would definitely take the trip again. Before school started this week, Geschickter took some time to answer a few questions about his experience abroad. I went on the trip because it was a once-in-a-lifetime opportunity that I could not pass up on. Not many kids have the opportunity to travel and play high-level basketball while being coached and mentored by two of the best coaches in the area. I was invited by Coach Normant after the high school basketball season ended and immediately told him I wanted to go. Was there any part of the trip that you were especially looking forward to? I looked forward to every game we played and off the court. I was looking forward to spending a day in Prague and sightseeing there. I also looked forward to trying traditional foods from all the countries we were in. What was it like living with a host family? I lived with two different host families throughout the trip. Both families were awesome hosts and were very nice and outgoing. The family in Germany took me out to eat a traditional German dinner called schnitzel, which I loved. In Belgium I was accompanied by a teammate unlike in Germany where I was alone. There the family had a traditional Belgium barbecue that was delicious. The biggest highlight of the trip for me was one of our games in Belgium. We played after two pro teams played so there was a pretty big crowd and the team we were playing was supposed to be one of the best under-21 teams in Belgium. We came out and played by far our best game and the game was never in doubt after the first quarter. The environment of the crowd and how well we played made it an amazing game. Every day there was a surprise of some sorts but the biggest surprise was our flight getting canceled from Amsterdam to Dresden the first day. A ton of flights at the Amsterdam airport was canceled and we had to wait about four hours to get help from the airline people. Some of us ended up sleeping on the cold airport floor but the airline ended up rescheduling our flight for the next day and putting us up in a hotel so it all worked out. What was it like playing basketball in Germany and Belgium? Playing in Germany and Belgium is definitely different. The style of play stood out to me as the main difference because the teams passed much better than most teams in America, but were not as good defenders or ball handlers as there are here.